The La Stella Philharmonic Society has just launched its membership scheme as part of the golden anniversary of Teatru Astra since it first opened its doors in 1968. Becoming a member of the La Stella Phil. 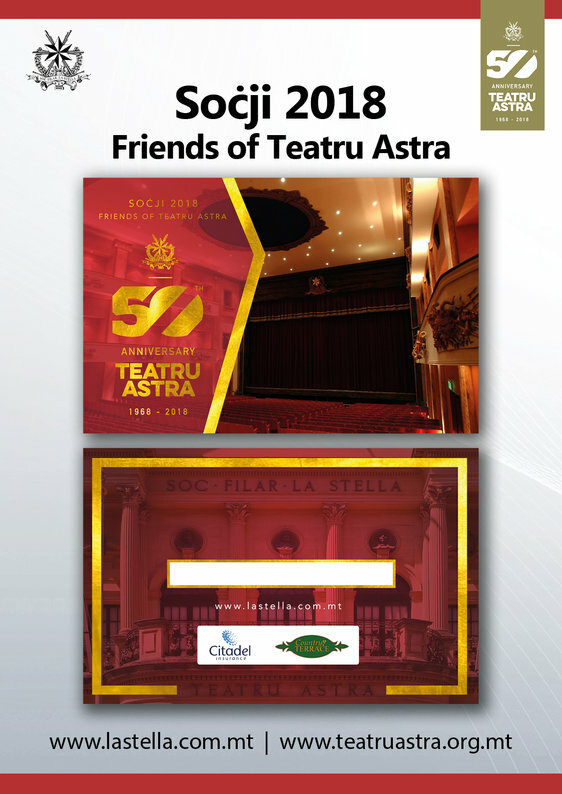 Society automatically enlists you as a friend of Teatru Astra, enabling you to form part of the glamour offered by the theatre while presenting several benefits. As a member you will be entitled to the following privileges and discounts on presentation of your membership card. 10% Discount on tickets for the forthcoming live-musical production of Jesus Christ Superstar (March 2018). 10% Discount on tickets for the forthcoming lyric opera production of La Traviata (October 2018). Have your name on the Guest List of the La Stella Philharmonic Society and Teatru Astra. Benefit from invitations for events organised by the La Stella Philharmonic Society such as the Annual Grand Concert, RockAstra, and other events. 10% Discount on the registration fee of Astra School of Musical Theatre (ASMT). 10% Discount on the Festive and Funeral Band Marches CD Albums. 10% Discount on the Annual Souvenir Festa T-Shirt. To become a member, you can apply online on www.lastella.com.mt and www.teatruastra.org.mt or by filling the application form that can be obtained from Astra Bar or members of the General Committee, along with a cheque of €15 (special discounted price of €20 for couples), payable to Soċjeta Filarmonika La Stella; Teatru Astra, 9, Triq ir-Repubblika, Victoria, Għawdex. Members will be presented with a full colour membership card.